Fantasy > Sci Fi > New Releases > Armchair Fiction > Double Novels > Armchair-New! Armchair Fiction presents extra-large editions of classic science fiction double novels with original illustrations. The first novel is David Wright O’Brien’s unusual science-fantasy, “Furlough from Eternity.” Can one journey back from the dead? Mike Gentry was one of the biggest big shots on the metropolitan gambling scene. For every fortune he lost, he won two. The difference with Gentry, though, was that he did it with style and brains—always tough, but always fair; and he always knew the good bets from the bad ones. But somebody wanted Mike Gentry dead. It happened in an alley. Once second Mike Gentry was on top of the world, the next second he was face down in the mud with his life’s blood running out of him into the ooze. But for Mike Gentry, his ultimate adventure was just beginning. It was an adventure into the realm of death and beyond. It was an adventure that would take him back to the world of the living, not only find the thugs who killed him, but to prove once and for all that a gambler could have the love and respect of decent people. Unfortunately for Mike Gentry, his very soul depended on his success. 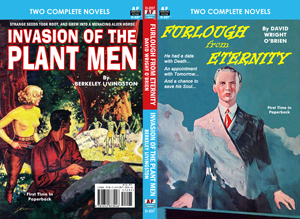 The second novel is Berkeley Livingston’s “Invasion of the Plant Men.” Scientist Homer Gordon was supposed to be on a casual, relaxing fishing trip to a small island out in the middle of God’s country with his good pal, Jeff Conners. And at first everything was hunky-dory: good times, good fishing—they even got to meet a breath-takingly beautiful girl named Daryl that Homer was soon holding hands with. It was turning out to be a great vacation. The whole trip started to go south, though, when a group of armed thugs showed up and forced them, at gunpoint, to a secret scientific facility located elsewhere on the island. That facility was owned by a strange scientist named Ongren. And it soon became apparent to Homer Gordon that Ongren was planning something so fantastic, so terrifying, that it threatened the survival of the human race. For smoldering in Ongren’s “garden” were the seeds of a diabolical alien invasion.